Yesterday, Bing released a surprisingly useful new feature around recipe search. If you search for “Chicken,” you can narrow the results down by “chicken recipes” and then a whole bunch of new filtering options appear down the left-hand column. You can further narrow results by recipe rating, cuisine (vegetarian, Spanish, Southwestern), convenience (quick/easy, family, entertaining), occasion (wedding, Valentine’s Day), main ingredient, course, or cooking method. Bing is big on guided search (showing relevant search categories to help narrow results), but this goes one step further towards semantic search (the ability to index and search the Web by different facets). Recipes are just the beginning, and it’s not just Bing. Google and a handful of startups, including Evri, Hakia, and Radar Networks, are hard at work on making semantic search a reality. The race is on to bring this type of semantic filtering for nearly every category of search across the Web. In fact, Bing’s recipe search looks a hell of a lot like T2, the semantic search engine being developed in private by Radar Networks. The startup currently offers a semantic bookmarking application called Twine which is on autopilot, but T2 is much more ambitious. Not many people have seen T2, but CEO Nova Spivack once gave me a demo and I took a bunch of screenshots like the one above (there are also slides on the Web). When you search for “chicken” on T2, you can also narrow by difficulty level, meal, main ingredient, dietary option, cuisine, course, and so on. Recipes happens to be one of T2’s strong suits. 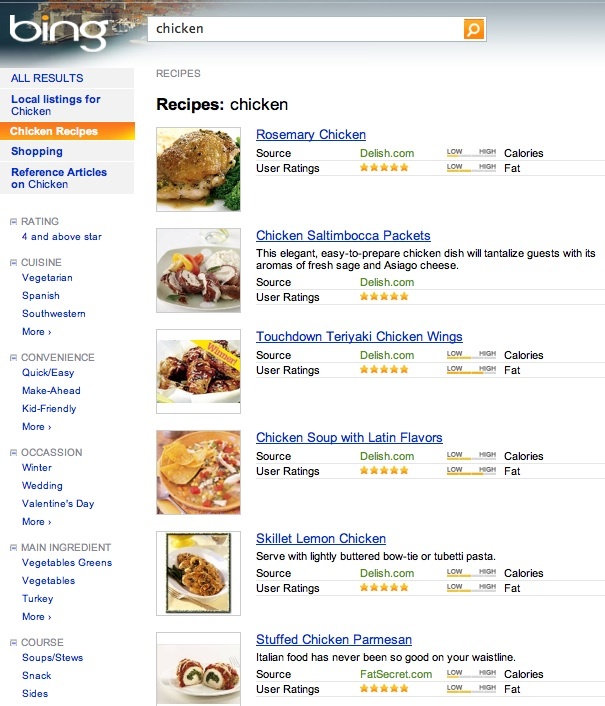 It has perhaps the largest semantic indexes of recipes in the world with 300,000 recipes. But it is also building out its semantic search index for video games, movies, music, travel, health, sports, and other category verticals. I bet that within 12 months Google and Bing will be fighting to enable best faceted search experiences. Just watch. It’s easy to read too much into these idle Tweets. Spivack is the CEO of a search startup. It stands to reason that he would have meetings with Google and and other big search engines about lots of things, ranging from licensing his semantic search technology to an outright sale. The one thing it is pretty safe to conclude is that both Google and Bing are very interested in semantic search. Bing seems to be further along than Google, as the launch of recipe search indicates. But both are facing a buy-or-build decision when it comes to semantic search. Bing’s recipe search is only based on partner feeds and tags, not a proper semantic index. Radar Networks is a serious player here, with a total of $24 million in capital raised since 2006. It owns four patents on the technology, with 20 more pending. Radar is essentially building a huge structured database for every page on the Web, which breaks down the information contained on those pages into well-defined facets. For recipes, it is ingredients, cooking times, and difficulty levels. For video games, it can search by title, developer, character, and so on. And since it is a structured database, it can jump from “Star Wars” video games to “Star Wars” recipes. It is all linked together in the semantic index. Radar is building that index across many different categories. each category requires its own ontology, or collection of facets which describe the things in that category. Radar is building out its own ontologies and also wants to create a SourceForge for ontologies where Webmasters can contribute as well. Some of the Webmaster tools Radar has developed will allow anyone who owns a Website to tell Radar about its Web pages. For instance, on a site about movies, the Webmaster would use a browser plug-in to mark the title, actors, director, reviews, and so on. Then Radar will take that template and apply it to the entire site. If Google or Bing adopted a similar approach, Webmasters would have a big incentive to train their semantic indexes because it would create deep links and improve their SEO. Like I said, the race is on.